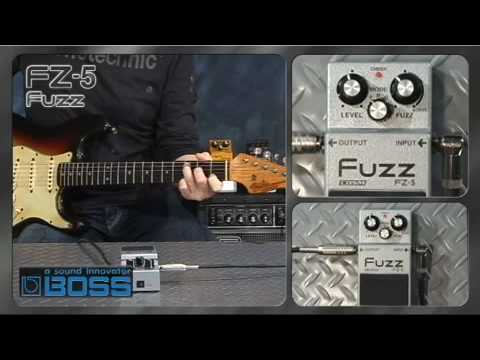 For anyone of any playing level who is looking to recreate classic fuzz tones like those of the '60s and '70s, the Boss FZ5 has what you need. The pedal brings together a mélange of three different but classic fuzz pedals and offers a big overdrive thanks to the clever technology behind the pedal. This modern pedal features a simple interface with just three main controls. Level controls the volume of the effect output, then follows the Mode selector and Fuzz control. A notable feature of the FZ5 pedal is indeed the Fuzz dial; with this control you can call upon the well-known fuzz tones of either the Maestro FZ-1A, the Fuzz Face or even the Octavia pedals. There also is an additional Boost control, and thanks to the COSM technology used to design the FZ5, you can roll the pedal right into overdrive, giving your sound plenty of aggression. For classic, vintage fuzz and overdrive all in a sturdy, reliable, metal chassis, the Fuzz FZ5 has it all for a road-worthy effects pedal. The FZ5 can be powered by a 9V battery which is supplied, or alternately you can opt to get an AC adaptor (PSA Series: optional). The pedal is easy to use with just an Input jack and Output jack, meaning it's good to go from the moment you take it out of the packaging. The Boss FZ5 is the ultimate Fuzz / Distortion pedal for any modern guitarist looking to bring back the best fuzz tones of old.